Rafael Nadal (above) won his eighth Grand Slam title and a second at Wimbledon with a victory over Tomas Berdych. LONDON, July 4 (Reuters) - A spellbinding display of brutal hitting and raw speed from Rafa Nadal secured the Spaniard his second Wimbledon title on Sunday with a 6-3 7-5 6-4 victory over 12th seed Tomas Berdych. Nadal, who has not lost here since the 2007 final after victory in 2008 and injury prevented his defence last year, completely nullified the 1.95m Czech’s biggest weapons to storm to an eighth career grand slam and open up a cavernous lead at the top of the world rankings. The win, which completed a second French Open-Wimbledon double in three years for Nadal, came after two hours and 13 minutes when his 20th forehand winner left Berdych stranded at the net on his first championship point. He celebrated by slumping on to his back on the baseline, holding his face in his hands before embracing Berdych at the net and performing an impromptu roly poly and double fist pump towards his entourage. 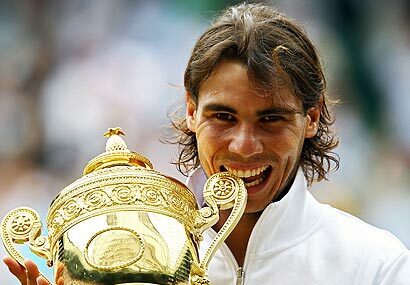 “More than a dream for me, always a dream to play in this final,” Nadal said in an on-court interview. From the moment Nadal bounced, weaved and stretched his way down the corridors of the All England Club to Centre Court like a fired-up prize fighter, there was a sense nothing could derail the 24-year-old. Both held their opening service games to love on a bright and breezy day, and neither was under early pressure, and even a male fan bellowing “I love you Rafa” could not throw the Spaniard’s focus. Game seven turned the tone of the match though, as Nadal stepped up a gear and Berdych’s first serve deserted him. Nadal’s forehand was starting to eat up the Berdych serve, and the Mallorcan brought the crowd to life with a searing forehand pass down the line to bring up three break points. A cutting backhand return had the Czech stretching and Nadal clenched his fist with stern-faced determination when Berdych’s forehand skewed out. The pre-match build-up had focused on the Berdych forehand, which had dismantled six-times champion Roger Federer and Novak Djokovic in the last two rounds, but Nadal reminded everyone that his is the most potent weapon in the game. Thanks for sharing admin keen wala ako alam jan sa sports . idol ko na xa hehehe..
...hindi rin aq mhilig sa sp0rts pero ang gling nia..npnganga tlga aq!...tnx.f.keen!